This example shows how to use IRFunctionCurve objects to model the term structure of interest rates (also referred to as the yield curve). This can be contrasted with modeling the term structure with vectors of dates and data and interpolating between the points (which can currently be done with the function prbyzero). The term structure can refer to at least three different curves: the discount curve, zero curve, or forward curve. The IRFunctionCurve object allows you to model an interest-rate curve as a function. 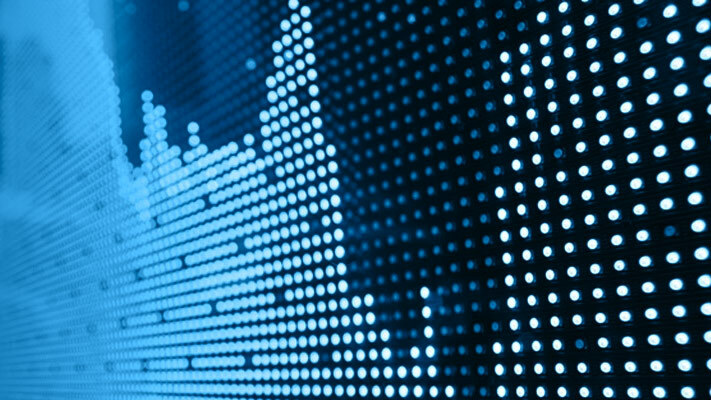 Note also that the data must be specified as a matrix where the columns are Settle, Maturity, CleanPrice, and CouponRate and that instruments must be bonds or synthetically converted to bonds. The IRFunctionCurve object provides the capability to fit a Nelson Siegel curve to observed market data with the fitNelsonSiegel method. The fitting is done by calling the Optimization Toolbox™ function lsqnonlin. The fitNelsonSiegel method has required inputs for Curve Type, Curve Settle, and a matrix of instrument data. IRFitOptions structure: Provides the capability to choose which quantity to be minimized (price, yield, or duration weighted price) and other optimization parameters (for example, upper and lower bounds for parameters). Additional instrument parameters, Period, Basis, FirstCouponDate, and so on. Fitting the parameters to this model proceeds in a similar fashion to the Nelson-Siegel model using the fitSvensson method. where the first term is the difference between the observed price P and the predicted price, P_hat, (weighted by the bond's duration, D) summed over all bonds in the data set, and the second term is the penalty term (where lambda is a penalty function and f is the spline). The parameters L, S, and mu are typically estimated from historical data. The IRFunctionCurve object can be used to fit a smoothing spline representation of the forward curve with a penalty function using the method fitSmoothingSpline. Required inputs, like for the methods above, are a CurveType, CurveSettle, Instruments matrix, and a function handle (Lambdafun) containing the penalty function. The optional parameters are similar to fitNelsonSiegel and fitSvensson. % Parameters chosen to be roughly similar to  below. Nelson, C.R., Siegel, A.F., (1987), "Parsimonious Modelling of Yield Curves." Journal of Business. 60, pp 473-89. Svensson, L.E.O. (1994), "Estimating and Interpreting Forward Interest Rates: Sweden 1992-4." International Monetary Fund, IMF Working Paper, 1994/114. Fisher, M., Nychka, D., Zervos, D. (1995), "Fitting the Term Structure of Interest Rates with Smoothing Splines." Board of Governors of the Federal Reserve System, Federal Reserve Board Working Paper, 95-1. Anderson, N., Sleath, J. 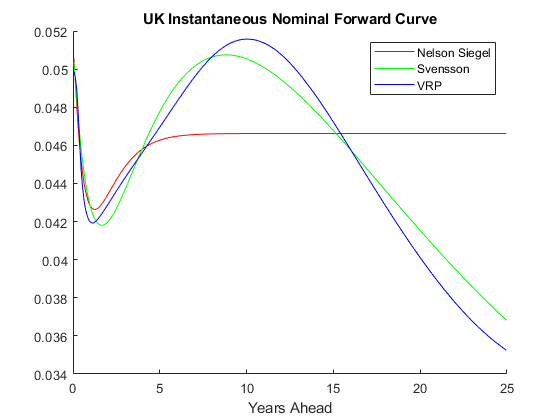 (1999), "New Estimates of the UK Real and Nominal Yield Curves." Bank of England Quarterly Bulletin. November, pp 384-92. Waggoner, D. (1997), "Spline Methods for Extracting Interest Rate Curves from Coupon Bond Prices." Federal Reserve Board Working Paper, 97-10. 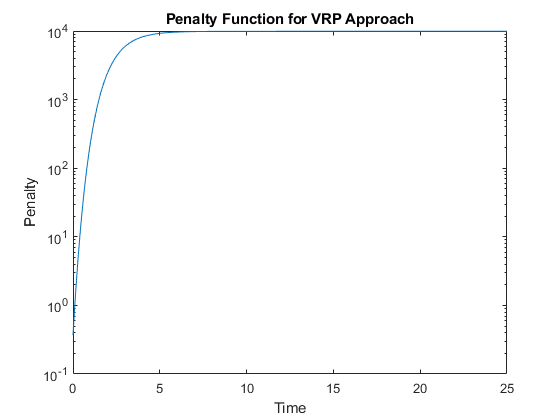 "Zero-Coupon Yield Curves: Technical Documentation." BIS Papers No. 25, October 2005. Bolder, D.J., Gusba,S (2002), "Exponentials, Polynomials, and Fourier Series: More Yield Curve Modelling at the Bank of Canada." Working Papers 02-29, Bank of Canada. Bolder, D.J., Streliski, D (1999), "Yield Curve Modelling at the Bank of Canada." Technical Reports 84, Bank of Canada.